For many people, a new year means new goals and resolutions. And we’re willing to bet that more than a few of you have resolved to be more productive and/or organized in 2019. If this is you, a good way to start is by taking control of your digital life. One approach is seeking out various bits and pieces of technology that can help make your day run a bit more smoothly. Productivity tools don’t just help you on an individual level. Businesses also benefit when they roll out some tools across their organization to improve operations while allowing employees to collaborate and complete tasks more efficiently. Take a look at these great productivity/collaboration tools and services that can be easily integrated into any organization. Whether you’re using Microsoft’s Office 365 for the home user or at the enterprise level, it’s chock-full of productivity-boosting options. Users can take advantage of its desktop, mobile and web-based applications along with 1TB or more of cloud storage via OneDrive, so they can open their documents and work on them anytime, anywhere. When it comes to collaboration, its tools are embedded within the new versions of the Microsoft Office Suite, so users can work together in real time when creating and editing documents. Similarly, tools like Skype and Yammer let you communicate on the fly via instant message, share files back and forth and jump onto video chats if necessary. With Skype, you can host a call with up to 250 participants and easily share desktops to present materials to your team members around the world or just across the office. Slack is a fantastic tool that connects to a variety of apps (okay, more than “a variety” - it’s over 1,500! ), which means you can increase productivity and collaboration between users even more. By being able to use so many apps seamlessly within one platform, users are able to streamline their tasks and workload. For example, discussion “channels” can be created to keep topics and departments organized as users chat about projects and share files. Unlike with dreaded reply-all email chains, users can pop in and out of Slack channels as needed, so they’re only involved in the parts of the conversation that are relevant to them without needlessly cluttering their inboxes. Of course, if you’ve been reading this blog for any length of time, you’ll know that we’re huge proponents of the cloud. By leveraging cloud storage and apps, your employees will be able to access documents at their convenience from any location. This not only helps to increase productivity in terms of greater accessibility and flexibility, but it also increases security. How? Cloud services reduce the possibility that your organization will become a victim of Shadow IT. Shadow IT is, essentially, when users begin to find unofficial workarounds to the systems in place in order to get things done. They aren’t intentionally doing anything wrong, but by sending a file to their personal email or adding it to their personal DropBox to access at home, they could be compromising the security of your organization. If you adopt proper cloud practices and protocols, you’ll be able to provide your users with the flexibility they desire while ensuring that your data remains secure. Are you wondering whether your organization has inadvertently become a Shadow IT victim? 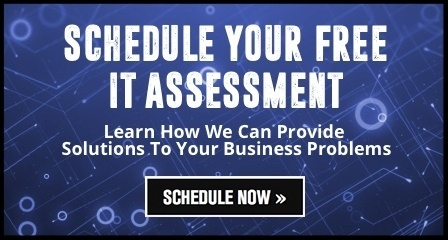 Schedule a FREE IT Assessment today.